Gently blowing a wish into the air through a dandelion puff while playing in the garden was a childhood favourite pass time spent alongside my parents who were tending to their vegetable patch. Little had I known that mamma also loved this wild green known as Tarassaco (Taraxacum officinale) or in more familiar terms as cicoria burda, cultivating both its jaggered leaves for cooking and its long trap root for medicinal purposes. Papa`oblivious to all of this would pull them out along with other weeds; occasionally we would notice some bitter undertones in our side of sauteed greens but were none the wiser for a very long time. This dandelion plant which I wrote about in my new section to the blog titled Wild Harvest, became a staple green on our dinner plates. Its bitterness we quickly became accustomed to over time and began to appreciate. Quietly, mamma continued to inform herself of its nutrients, purifying and anti-inflammatory properties based on what she had learnt from her mother. Of course the endless readings from the health section of Oggi magazine that my sister borrowed for her from the library further ignited her passion on health; and later to be gifted an Italian health book on erbe medicinali (medicinal herbs) from a friend. This edible wild green has now become my fascination and I am looking at ways of using it more in my cooking for the same reasons as mamma did. The combination of a bitter green with a mash of creamy potatoes used in this recipe, will mellow the bitterness, complimenting each other so well and making a perfect introduction to the dandelion greens. 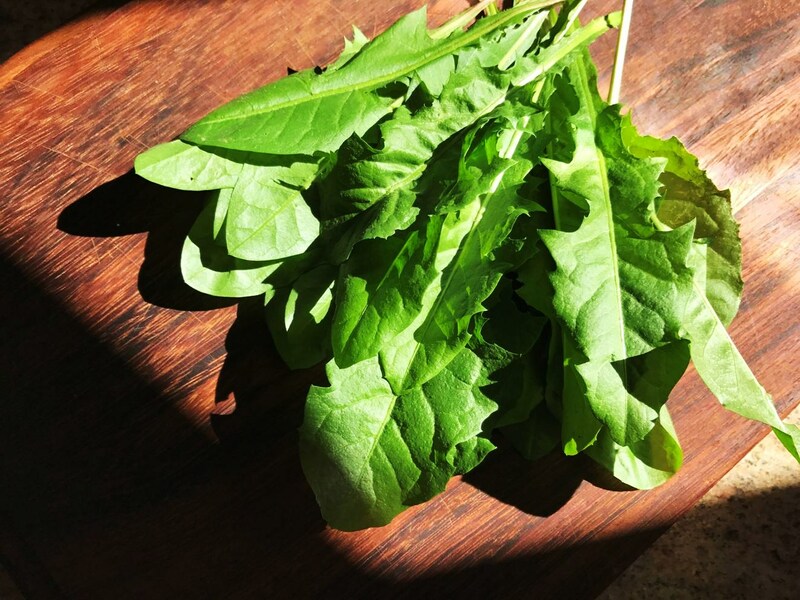 However, if you don't feel confident using the wild variety, you can use the market bought Italian chicory leaf vegetable called catalogna frastagliata, which is just as bitter. In fact, any leafy green will work well if you are not keen on bitter flavours, such as the very mild spinach or kale. Along with my fellow bloggers from Cucina Conversations, we will share with you various vegetarian and vegan recipes for this lean month of Quaresima (Lent). Crocchette di patate e cicoria (potato & chichory croquettes) is my recipe choice that mamma often made for us when meat was not eaten during this period of time; a favourite of mine, and a dish my girls grew up loving as well. It was a great way of hiding some greens when they went through a fussy period of eating and later I even began adding cooked tuna within the mix for added nutrients when they refused to eat fish. Then once my eldest daughter decided to go totally vegan about 2 years ago, I stopped making them completely as I couldn't get my head around the notion of vegan cooking. Over time and in the last month with the idea of including wild greens in my cooking, this recipe has resurrected and I have begun experimenting with ways of combining bitter flavours to this creamy mix of potato 'deliciousness'. This dish is categorised as a vegetarian recipe, which I have also recipe tested and made as a vegan option for my daughter by omitting some ingredients and replacing them with others. The ingredients and methods for both vegetarian and vegan options have been presented below. The girls from Cucina Conversations will also post throughout the week and share their lean recipes. Marialuisa shares her recipe for a side of silverbeet with cheese called pasticcio di bieta e formaggio at Marmellata di Cipolle; Rosemarie prepares one of my favourite vegetables - artichokes, in a dish called carciofi trifolati at Turin Mamma; Daniela shares a recipe for a lean pasta bake called pasta al forno di magro at La Dani Gourmet; while Lisa bakes a torta salata con zucca e radicchio at Italian Kiwi. Francesca cooks a frittata di spaghetti e asparagi at Pancakes and Biscotti and Flavia bakes a rustic spinach tart called torta rustica di spinaci at Flavias Flavors. As you can see, there are so many delicious meals planned out so make sure you check out all their blog post. For those that suffer from allergies or choose to stay away from any animal products completely, you can enjoy this dish as well. NB: highlighted sections denote ingredients and method for vegan option. Chia seeds are the best way to create the same binding technique that eggs naturally possess and pack in lots of protein, fibre and omega 3 fatty acids so you won’t be missing out on nutrition. Chia seeds mixed in liquid become gelatinous expanding and soaking in the liquid. This makes them a great swap for eggs in recipes. It is best to use ground chia seeds which you can grind in a mortar and pestle. 1 tablespoon of ground chia seeds to 3 tablespoons of water equates to 1 medium sized egg. Stir and leave to soak the water up for 5 minutes until it becomes gooey. Rinse and place whole unpeeled potatoes in a saucepan of cold water and bring to the boil. Cook until potatoes are tender when pierced with a knife. Drain, peel and finely mash potatoes with fork or through a potato ricer. Set aside to cool completely. Meanwhile, trim and rinse the chicory / dandelion or other green leaves and finely chop them. Peel and crush one clove of garlic and place in a fry pan with 4 tbsp of olive oil and sauté the garlic along with the greens for about 15 minutes until cooked and all its liquid has evaporated. It is important that all moisture in the greens is removed to ensure a dry mix. Remove from the heat to allow the greens to cool completely. In a large bowl place the mashed potatoes, cooked greens, parmesan cheese, parsley, beaten egg (or soaked chia seed mix), salt and pepper and mix well to combine all ingredients. Depending on how sticky the mixture is, you may need to add some corn flour to obtain a firm yet pliable mixture. Place flour, egg mixture (omit both for vegan option) and breadcrumbs in separate bowls. Using wet hands place a tablespoon full of mixture and shape into logs of approximately 6 cm long and 3 cm wide and place on a tray. Repeat with the remaining mixture which should give you about 12 croquettes in total. Roll the formed croquettes in the flour, then dip in the egg and finish by rolling in the breadcrumbs. For a crunchier crust, you can repeat the process several times. For the vegan option, roll directly in the bread crumbs several times to fully coat and absorb all the moisture. Refrigerate the croquettes for half an hour as this helps with keeping their shape when cooking. For the vegan option, I recommend baking them in an oven to avoid too much handling. Place croquettes on a tray that has been lightly sprayed with vegetable oil. I also lightly spray the croquettes. This allows for crisping on both sides without needing to turn them. I have often baked croquettes and find them to be just as delicious. In a large heavy based frying pan, fill with 2 inches of oil and heat up to 180 C. You can also test how hot the oil is by dropping in a cube of bread. It should turn golden in 5 seconds. Cook the croquettes in small batches - 4 or 5 at a time, turning regularly until golden. Drain on kitchen paper and repeat with the remaining croquettes. The croquettes should be served hot maintaining their crunchy exterior and soft center, but also lovely cold for lunches making a great school snack, finger food or enjoyed at a picnic lunch. Experiment with different greens if you prefer the milder flavours, but I absolutely love the combination. I hope the inclusion of the vegan recipe will assist in providing options as it has for me. Stay tuned for next months Cucina Conversations which is all about Easter recipes! I just ate these greens for lunch as a side dish. What a coincidence! I've been inspired by wild greens a lot lately too (it is the season here for them) and am looking to find out more about the edibles I can forage. The ones I ate I bought from a farmer at my local market. He often sells wild plants and herbs he forages too. You and your mum seem to know a lot about wild edibles. Perhaps you have a good book recommendation on the subject (in English or Italian)? If so, do let me know! Also, must make these croquettes. I have a feeling my dad would love your veganised version! Thank you Rosemary, I look forward to the many that are harvested during Autumn to Spring such as the Mallow and Stinging Nettle, a few of the ones that Mamma has in her garden. Then there's the Cardoons and Wild Fennel which will require a trip to the country. You are fortunate to live in Italy where these wild greens are widely sold. Yes, Mamma is well informed and her favourite book is coming handy. It is called: La Salute dalla Farmacia del Signore (consigli ed esperienze con le erbe medicinali) by Maria Treben First published in 1980 and sold over 4 million copies at the time. hope you father will enjoy the vegan recipe as much as my daughter does. I love any kind of croquettes! These sound fabulous with the dandelion greens in them. We have lots of dandelions coming up in the garden right now. I need to go out and do some harvesting! Glad to hear that you like dandelion greens too Lisa. You will love using them in this recipe. Happy harvesting!